Convenient and economical! Here's how it works. Build the two- or three-gang concrete floor box you need by simply locking single gang boxes together. Connections on opposing sides allow single-gang FLBC8500 boxes to lock securely together. Lock two boxes together for a two-gang box. Add another single gang box to make a three-gang box. 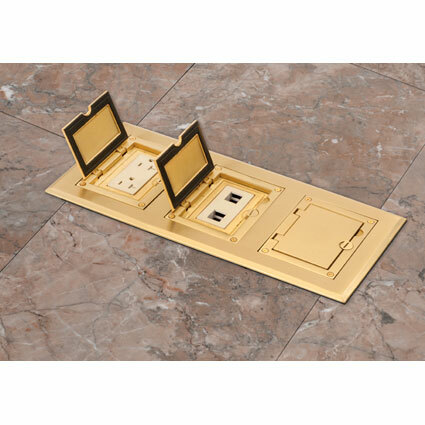 Then select the metal frame/cover kit that fits the box: single, two- or three-gang, in plated brass or plated nickel. The cover kits include devices so you’re all set. Fast and easy installation. Install the frame on the box. Add the devices, then attach the gasketed metal cover to the frame.